A statue at the centre of an international heritage row is thought to have been exported to the USA. The Sekhemka figurine was sold by Northampton Borough Council for nearly £16m in 2014. Auctioneers Christies had refused to state where it was going and there were rumours it may have ended up in a private collection in Qatar. However, it has emerged the Department for Culture, Media and Sport granted an export licence to the US in April. It had initially imposed an export ban - due to the statue's cultural significance and "outstanding aesthetic importance" - but this was lifted after no UK buyer came forward. 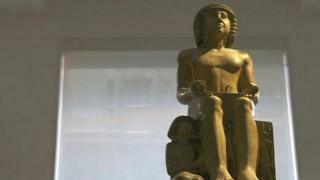 The sale of the 4,000-year-old statue, believed to be of a high court official, had been opposed by Egypt's antiquities ministry. Last week BBC News revealed how the council, which made £8m from the sale, had been warned by lawyers not to sell it for "financial motives". The council said it sold the figurine to help fund a £14m extension to its museum and art gallery.